I have the honour of supporting the mighty Fia Rua this coming tues in Whelan’s so come down and enjoy! Brownbread Mixtape was great on Wednesday and I really enjoyed playing at it. Stephen James Smith,EleventyFour, Elder Roche, Kalle Ryan, Enda Roche, and the brown bread players were all amazing! Watch it below! Nighthawks is a great event. Here’s the details so do consider coming to it! 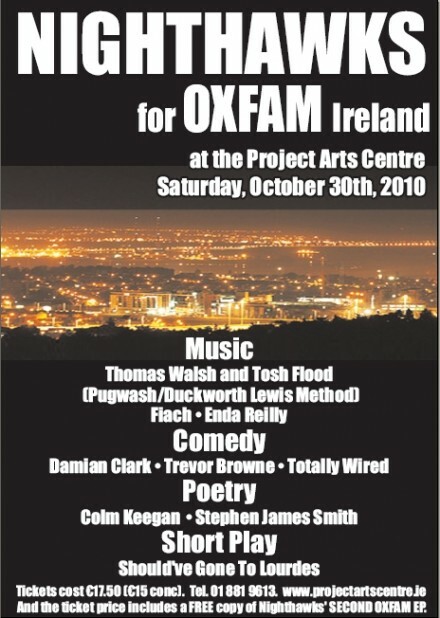 Nighthawks will be doing a special one-off show for OXFAM Ireland at the Space Upstairs in the Project ArtsCentre on Saturday, October 30th. Music guests on the night will include Thomas Walsh and Tosh Flood (Pugwash / The Duckworth Lewis Method), Fiach and Enda Reilly. There will also be music and comedy from Trevor Browne and Totally Wired – and stand-up comedy from Australia’s finest – Damian Clark. There will be performance poetry from Colm Keegan and Stephen James Smith – both did great sets at this year’s Electric Picnic – and there’ll even be a short comic play called Should’ve Gone To Lourdes.